In 1997, Sundance Film Festival Director Geoffrey Gilmore wrote, “‘Colin Fitz’ is the kind of independent filmmaking that shows how much can be done with very little and underscores the endearing qualities of well-written dialogue and comic inspiration.” The movie’s been called by the press and its fans, “The Best Film Never Released.” So – what happened? Filmmaker Robert Bella offers a first person perspective on “Colin Fitz,” a film that debuted at the Sundance Film Festival in 1997 but was just acquired by IFC Films & Sundance Selects this year. All of my life, I’ve dreamt of making movies. I wish I could say that I immediately started making home movies and the rest was history. I wrote my first “screenplay” in elementary school. In high school, I fell in love with the theater and started a romance that has lasted over 25 years. I wound up going to New York University to study acting with Stella Adler, David Mamet and William H. Macy. Upon graduation, Mamet and Macy encouraged my class to form The Atlantic Theater Company. We began acting, writing, producing and directing our own plays in 1985 and we have been doing it ever since. But all the time I was working Off, Off-Off and Way-Off Broadway, in my mind – I was still making movies. It really all started way back in May of 1996, when my friend Tom Morrissey invited me to take part in a reading of his brand new screenplay, ‘Colin Fitz.’ The reading was a blast and even at that early stage it was clear that Tom had an incredible gift for comedy. So, on July 1st, 1996, I set out to make an independent feature film, despite the fact that I had absolutely no prior filmmaking experience. After a few more states rolled by, I decided to do something proactive with my career. From the bottom of Carlsbad Caverns, New Mexico, I called Tom up and told him I wanted to direct his script if he was up for it. I knew nothing about making movies, but I had read all the Sundance/Indie Film Success Stories and Tom’s screenplay seemed perfectly tailored for independent film. Thankfully, Tom agreed and so – off we went. On July 1st, I began to feel out a pool of talent from the actors and crew that I’d had the good fortune to work with as a member of the Atlantic. William H. Macy and Matt McGrath agreed to star. Atlantic friends Andy Fowle, Martha Plimpton, Mary McCormack, Chris Bauer, John C. McGinley and Julianne Phillips came onboard, too. These amazing actors all loved the script and were committed to the project, but only if we could shoot right away. I saw my window of opportunity and decided to go for it. On August 1st, I asked some producer friends if they thought we could start shooting in mid September and wrap soon thereafter. I had inherited $50,000 and asked them if that was enough money to make a movie. (Mind you, this was before the “digital revolution,” way back when you actually had to shoot, develop and cut film. In those days, common wisdom was that an independent movie shot on 35mm would sooner or later cost you at least $500,000.) My producer friends flat out informed me that it couldn’t be done. Not only that, but that I was crazy to try. Luckily, quite a few other friends decided that “crazy” was not necessarily a prohibitive factor. On September 16th, principal photography commenced, and we wrapped two weeks later on October 1st. Most of that time was spent shooting in the pouring rain in Woodlawn Cemetery in the Bronx, NY. The film was shot on 35mm and was “in-the-can” for $150,000. Despite the pouring rain, and the very low budget, the shoot had gone extremely well. At this point, we were all pretty proud of ourselves. We had achieved “the impossible.” We were “the little film that could.” The cast was brilliant, the footage looked great, and we knew that we had a very special film on our hands. But by mid-November, the bank account was empty. The plan was to shut down, raise more money, and finish the film in 1997. Then, as the production was literally being boxed up for storage – Sundance called. The good news: the film had been accepted into Dramatic Competition. The bad news: a 35mm print had to be in Park City, Utah. In 8 weeks. Eight weeks to lock picture, sound, and music, mix the film, cut the negative and then create a film print. With limited time and none of the money needed to finish the film, I did what every other resourceful independent filmmaker does – I maxed out my credit cards. Twenty of them – for a grand total of $100,000. The film made it to Sundance on time and received a tremendous response from audiences and critics alike. I will never forget our sold-out World Premiere at the Prospector Square Theater. With the audience all gone, my co-producer Patti Wolff pulled me aside to say that “Roger” wanted to speak with me. His words were prophetic. But perhaps not in the way that he intended them to be. It was after Sundance that the fantasy stopped, and the nightmare began. Robert Bella (right) with William H. Macy (left) at the 1997 Sundance Film Festival. Image courtesy Robert Bello. This is not to say it all went badly. “Colin Fitz” went on to win awards at festivals all around the country. Harry Knowles dubbed the film, “A cult hit!” and awarded it Best Of Fest at the Austin Film Festival. To this day, a never-ending source of joy for me was hearing people all across America laugh out loud while watching the movie. I got an agent, a lawyer and a publicist who wanted to represent me. Meetings were being set up. I was going to move to Hollywood! It truly seemed like a dream come true. Distribution deals were offered, but unfortunately none of them would cover all of our finishing costs. I was quickly facing the realities that my original naysayers had already foreseen: to complete the movie on film so that it could be sold to distributors was going to cost at least an additional $250,000. This included music rights, lab costs, and deferred vendor/crew salaries. 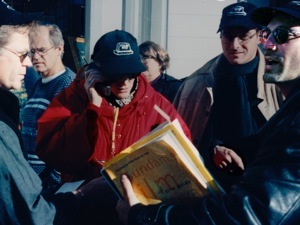 All told, it was going to put us right about where everyone said we would be at – a half million dollars to make a 35mm independent feature film in 1996. My investors were tapped out. My credit cards were maxed. The digital revolution was still years away. And my flux capacitor was out of fuel. I had to pass up on the various distribution offers until I could get myself and the film out of hock, thus beginning an intense odyssey which is only now coming to a close. When things got hard, I would remember the audiences’ laughter, and I would assure myself that the film would prevail so long as I hung in there. But it wasn’t easy. I moved to Los Angeles. I took meetings. I came very close to getting a number of other projects off the ground. In the span of 6 years, I had 4 films that all fell apart for one reason or another (the financing would disappear, we would lose cast availability, etc.). I investigated bankruptcy, but I was told I would lose the rights to my one and only asset – the movie I had worked so hard to create. My life’s dream. So I persevered the best that I could. Disillusioned by Los Angeles, I moved back to New York City and made a living the only way I knew how – by working in the theater. It took nearly 8 years to dig out from the personal debt, and then 6 more years to buy back the pieces to complete the film. One by one, I paid down my credit cards so that I could use that money to finish “Colin Fitz.” Little by little, I would buy back pieces from the vendors who had so graciously deferred payment in 1996. Friends often questioned why I kept on trying. “Let it go,” they advised. And they were right. I couldn’t make my life be about just one film. So I didn’t. As I was buying back “Colin Fitz,” I decided to return to my indie roots. I determined to teach myself how to write, produce and direct films on a truly low budget, just like the Atlantic had when we first started our theater company. I invested in a digital camera and taught myself Final Cut Pro. I started making micro-budget movies. I made one feature film in New York City for $25,000. I shot another one in France in 5 days – that one only cost $5,000. I took every lesson gained on “Colin Fitz” and essentially put myself through the film school I had never attended. First, the Colin Fitz estate resolved their legal issues and graciously agreed to let us use Colin’s music as the score to the film. Not having all the music rights was a huge obstacle for us back in 1996, and it prevented a lot of the early distribution deals from going through. Second, time caught up with technology. After the digital revolution, I no longer needed to create 35mm prints and assets. I could release the film digitally On Demand. This was a massive savings (with a huge assist from Deluxe New York). Third, my sister and brother-in-law, who are a professional and incomparable sound team, volunteered to help me complete the sound design and editing that I never really had the time for back in 1996. Another incredible stroke of good fortune. I couldn’t believe it. After all those years – it was just that easy. I recall one of the darkest times I survived over these past 15 years. It was a number of years back and once more, I could no longer afford to pay my rent. I was in the process of moving yet again to a much cheaper apartment. But there was going to be a month or two before I could move in. I wouldn’t have called myself home-less. But I was definitely heart-broken. At this point in my life, I had called in so many favors, crashed on so many couches, and borrowed so much money from friends and relatives that I simply could not bear to ask for yet one more favor. So. I slept in a storage space. Along with all my worldly possessions. What was I doing with my life? Why was I continuing to sacrifice so much for this project? Was my childhood dream of being a filmmaker just that – the fantasy of an unformed mind? Should I take my friends’ advice and just let it all go? Could I install Cable TV in the cubicle? Years after I left my cubby-hole, I saw Tyler Perry on Oprah. He talked about living in his car as he struggled to get by and about the faith that carried him through those times. – Tom Morrissey’s brilliant writing that inspired all of this madness from the outset. – The memory of an amazingly dedicated cast and crew slogging through a rain and mud drenched cemetery in the Bronx. – William H. Macy and Martha Plimpton huddled under cheap umbrellas because we didn’t have holding rooms, let alone trailers. – The kindness and generosity of the cast, crew, vendors and investors who gave so much of themselves to help make COLIN FITZ LIVES! what it is today. – The love and patience of the many, many friends who helped me before and after Sundance to survive and grow as an artist and as a person. – The phenomenal good fortune to know the gifted musicians Jason Downs and Matthew Puckett, whose work on the music, before and after Colin Fitz’ death, is nothing short of brilliant. – All the incredible people at Deluxe NY who painstakingly salvaged the decaying negative and turned it into an elegant electronic entity. Mike Jackman – you truly are a mensch. – The support of my loving family, most especially Andrea and Micha – Sound Geniuses. – The thousands of audience members who filled my heart with the sound of their laughter. If it turns out that Roger’s prophecy came true in some perverse way, and I only make one film in my life that the world will see, then I am proud to say that this is the one. I hope you have as much fun watching it as we did making it. “Colin Fitz” will debut on IFC Films’ Sundance Selects on August 4, 2010 and have its LA premiere at the American Cinematheque at the Aero Theater on Thursday, August 5th at 7:30pm.